Luxurious living is especially fun when it comes to your personal room, and the comfort of your bed! Check out these fantastical bedrooms of your dreams! 1. The large window wall with a stunning view, along with the parquet floor, the pillows, and the padded, upholstered bed make it an overall comfortable and stunning room. 2. The whiteness of this room takes a lot of cleaning. The fluffy carpet, white leather couches, and satin sheets all look quite welcoming. 3. The padded wall, bed, and floor, along with the reading corner, looks like an overall plush room. The chandelier is also a nice touch to make this room luxurious. 4. This room is stunningly modern, clean, and we love the fireplace and parquet floors! 5. This room is so textured, it is stunning. 6. The satin curtains and matching colors and beautifully designed furniture all together make this room very attractive. 7. 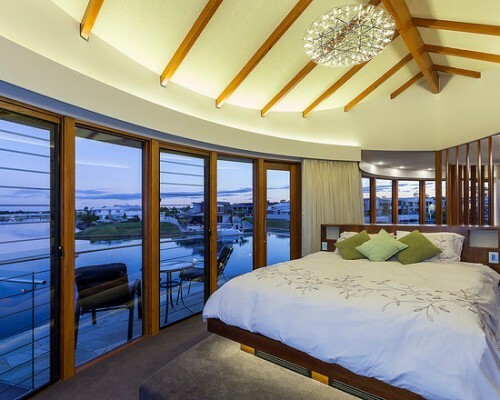 This room’s high ceiling and stunning view are what make this room luxurious. 8. This bed is so unique -with its clear glass frame and matching night stand, and even the wall paintings, rug, and floors are white! The view is to die for, and all of these factors combined make this room irresistibly stunning. Looking for some more dreamy bedrooms? Check out the photo gallery we have below! It is filled with more stunning images.